He stated that we should continue efforts to make the country stronger. KARACHI (APP):The Governor of Balochistan, Muhammad Khan Achakzai, has said that the China-Pakistan Economic Corridor(CPEC) will open up new avenues of the development in the country. He was talking to media after visiting the mausoleum of Founder of Pakistan Quaid-i-Azam Muhammad Ali Jinnah here on Sunday. 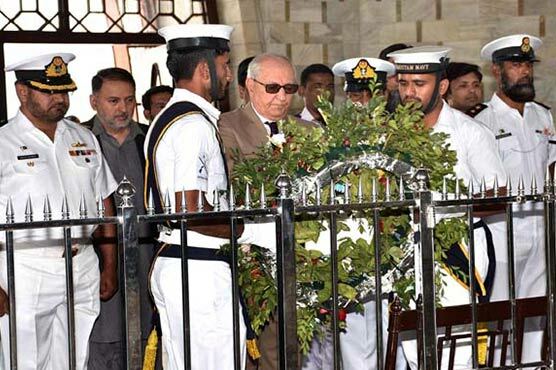 The Governor laid wreath at the mausoleum of the Quaid, offered Fateha and recorded his impressions in the Visitors’ Book. He said that Quaid-i-Azam gave the Muslims of the sub- continent a separate homeland so that they could lead their lives with freedom. Achakzai said that it is incumbent upon all to make concerted efforts to make Pakistan strong and prosperous as desired by the founder of the country. He stated that the CPCE will open up new avenues for the development for Pakistan as well as the countries of the region and that no one could harm this mega project as the machinations of the enemies would be frustrated. Governor Balochistan said that Pakistan of today is strong as compared for the past many years.